I traveled through time last evening. Jimmy Messina of Buffalo Springfield, Poco, and of course Loggins & Messina fame, performed in little Bigfork, Montana. I have to admit that, until recently, I had thought Messina the lesser talent of the Loggins & Messina duo — the jilted Art Garfunkle, if you will. But after hearing his masterful stage presence and, now, looking at his long musical repertoire, I realize that I was wrong. Very wrong. Jimmy Messina is a powerhouse in his own right — a skilled and creative music writer, performer, and producer. I was blown away by how many great songs he wrote or co-wrote (let alone performed and produced). I had forgotten, but the concert brought them all back — one after the other. And now at the age of 70, he is a country/rock historical figure too — at the center of the Buffalo Springfield birthing of such legendary bands as Poco and Crosby, Stills, Nash, and Young. Many would argue that he helped lead the way for the mega-successful Eagles as well. Speaking of “Young,” fellow Poco founder and steel guitar extraordinaire Rusty Young sat in on a number of songs. He also played his hilarious Neil Young is Not My Brother. 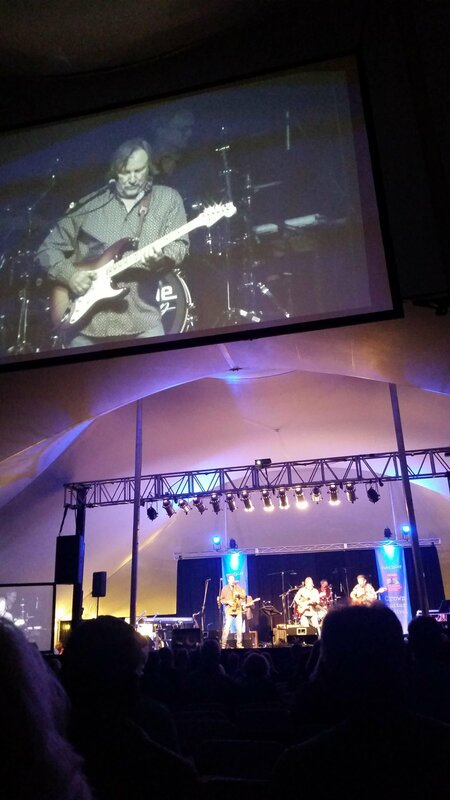 Both Jimmy Messina and Rusty Young were in town for Bigfork’s Crown Guitar Festival.